This has been a trying week for me. My girl seems to think there is more to life than hanging out with me all day, catering to my every need and whim. So she's been hogging all the computers in the townhouse, day and night, working on resumes. With Gloman out of town, I may as well be living out on the streets. I'm lucky if she finds her way to my food dish. Litterbox maintenance... well let's not even go there. In fact, if things don't change, I just might not GO there either. Since my catly charms have done nothing to distract my girl, I've decided to help in the best way I can. I've prepared a sample resume' of my own so she can see just how simple it really is. There. Now hurry up and stop already. I'm waiting. Pee. S. As if this week wasn't just a slap in the whiskers... would you believe the suitcases are coming out of the closet? Lots and lots of laundry. Stacks of t-shirts, shorts. Even sandals are showing their straps. This is not looking good for me. I smell Cat Sitter. There is talk of a Florida vacation. But, but, what about the Cat-O-Lympics??? What about my blogging friends??? Sadly, I may be somewhat incommunicado next week. So please, please, please don't forget about me. I'm going to slip a few ideas into Glogirly's laptop case and cross my paws that she at least posts a couple of my award winning Olympian photos for you. You can teleport over to our house while Glogirly is gone. If it makes you feel any better, we're freezing here in Florida!! Glogirly might not be wearing those open sandals! With that resume, if you were looking for a job, Katie, we know you'd get it! Sorry that Glogirly and Gloman are leaving you...maybe you could sneak into one of those suitcases when they're not looking! We love your resume - we think it is a great example for everyone. And well, we totally understand going to Florida because it is way to cold most places right now! We hope to see you at least a little in the Cat-O-Lympics - we are having events at our place and the Naughty Kitty Club (all kitties welcome), and we think you'd probably be good at them. We hate it when those boxes with handles come out! Hey, you're already a gold medal gal in our book Katie! Your resuime is furry impressive! We'd hire you in a New York Minute! Sorry to hear that the dreaded suitcases are back in sight. Make sure you tell GloGirly she must buy you LOTS and LOTS of souveniers for dumping you! Our 'beans are deserting us this weekend too, but we're just gonna have a PAWTY and show them! And as for leaving something in their suitcase...How 'bout a nice Katie Tootsie~Roll? Happy Valentine's Day Sweetie! Katie,, I would hire you in an instant. You seem overly qualified to manage any household. Maybe you should have Glogirly forward you credentials to you sitters so they know who they are dealing with. Florida sounds nice for humans but you wouldn't like to go outside. Wonderful resume Katie! I am so sorry your Glogirly and Gloman are leaving you for a vacation. Sometimes humans have to go away. It has nothing to do with them not loving you. I'm sure they will make sure you are taken care of first class, and they will return! As long as you are in your own home with a baby sitter visit each day you will like that better than going on a trip with them! This will give you a chance to sleep as long as you want to and the time will go by very fast and then your Glo's will return and it will be like they never left!!! You are very lucky to have such wonderful humans that love you so much! Oh, noes! Not the suit-cases! We hates it when da beans drag those out. We no fits inside..dey stuffs dem too full of cloze. But we are sure you will be well taken care of while dey are away. WE alllus get extry treets frum our sitter, and snuggles too. An by da way... dat iz a furry impressive ree-sume you haz der! You iz furry qwalified to run any howse. NOOOOOO!!! A week without Katie...how awful. Maybe tonight you can try again with those cat charms and if that doesnt work just take charge and demand posting even during vacation time! I mean you can make posts ahead of time. Katie, that's an impressive resume. Far more so than that of our human slave. Er, typist. As for your humans leaving you with a cat sitter--if you make them feel guilty enough, they might bring you presents. That's the least they can do! You poor little thing. How could she possibly leave you even for a day? Great resume. Oh me oh my you took my Momma's breath away in that last photo. She just wants to give you all kinds of smoochies. Yeah, I know she embarrasses me too. Pssst listen Katie we're in Florida and guess what? It's freezing here. We have to wear coats and gloves and boots cuz well it's soooo cold. In fact we may have snow tonight (it's 50 50 whether we will or not)...yep it's doggone cold! Ya know it's wise that they don't say catgone cold. Looks like you've had a rough week. I'll be here when you get back. Oh no! Not the dreaded suitcases! We will miss you but we certainly won't forget you. Impressive resume. Of course we won't forget you. Maybe you should look upon this vacation thing as an opportunity. With the glopeople out of the house you have more time to devote yourself to things like curtainclimbing training. Love your resume, you could be a professional resume writer. You could come and stay with us while your girl abandons you for a little sun and surf. I will let you wear my bowler. What? They are going on a vacation without you? Unbelievable. We will miss you but there's no way we'll forget you! 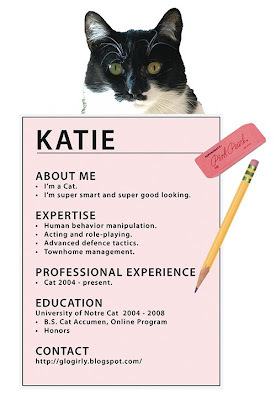 excellent resume Katie - Petie and Kip would love to have you here...maybe they will hire(?) you?! tehe! i love the pink paper. it's a hard life being a cat eh? sigh...well lucky for GG that you put up with her antics! GG needs to take tips from you for sure. I sure hope GG can manage to post your best sports from out of town. 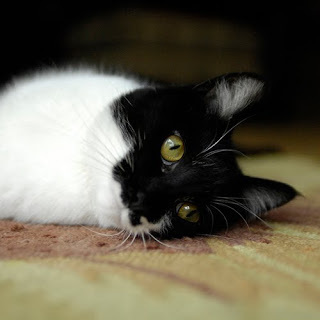 Hope the cat sitter takes good care of you! Katie...What a story, what a day, what a week!Cat sister???? Oh gosh!!! And I'm so impressed about your CV, it's wonderful! I need to confess that I'm also worried about some news here as well. At least mommy is recovered from the awful cold. Brother is coming back to Brazil today and I'm so sad because he is really cool and nice with me and...I will miss him a lot until next vacation from University. And for my despair...dad, mommy and sis are going to travel also, for some days. So dear Katie, we could play in our dreams, what do you think about it? Don't be upset, I will be here thinking of you. Poor Katie, this is neglect on a disasterous scale. How could Glogirly do this to you when your resume is so brilliant. Maybe she is envious of your qualifications and the Florida trip is revenge? We hope your spirit isn't too dampened by this treachery and the pet sitter gives you lots of attention. This will give you time to catch up on all those DVD's that have been stacking up on your shelf Katie! p.s. I'd hire you in a second! Great resume! That's a great resume Katie! 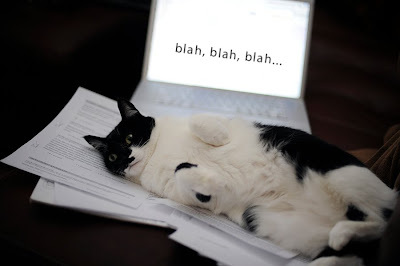 Do you want to come work for us at the Casbah Kitten? 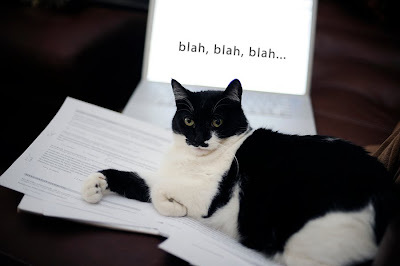 We need a good PR cat. As for the vacation sans cat? Hmmmm, we smell a house trashing party in the works. . . . let us know when to come over! Oh sweet gerl ~ we can't believe they cud leave yoo just before Valentine Day! Wot sort of love is that? How unfair. Your resume is brilliant and they shud appresheate yoo MORE! Srsly. You are an excellent resume writer. You hit all points and it is simple and easy to read. With Glogirly going away, she can let her mind relax and all kinds of new possibilities and opportunities will arise. We can feel it. We can also feel a house trashing a comin'. Smells like house trashing party to us! We'll be right over! Your resume is quite impressive! I'd invite you to come play at my house while Glogirly is gone but I only have a couple of squeaky toys and a Nylar bone to my name, no $$ for plane fare. You has a nice resume if you wants to come works wif us!